Research reveals that “number sense” is basic to all animals, and not just human beings. For instance, creatures that hunt or gather food use it to ascertain where they can find and procure the most nuts, plants or game, and to keep track of the food they hunt or gather. We humans use it daily to allow us, at a glance, to estimate the number of open seats in a movie theater or the number of people in a crowded meeting. And it is measurable, even in newborn infants. Though the link between ANS and formal mathematics ability already has been established in adolescents, Libertus says her team’s is the first study to examine the role of “number sense” in children too young to have already had substantial formal mathematics instruction. The team tested 200 4-year-old children (on average) on several tasks measuring number sense, mathematical ability and verbal ability. The children were rewarded for their participation with small trinkets, such as stickers and pencils. The children also were given a standardized test of early mathematics ability that measures numbering skills (verbally counting items on a page), number-comparison (determining which of two spoken number words is greater or lesser), numeral literacy (reading Arabic numbers), mastery of number facts (such as addition or multiplication), calculation skills (solving written addition and subtraction problems) and number concepts (such as answering how many sets of 10 are in 100.) This standardized test is often given to children between the ages of three and eight years. 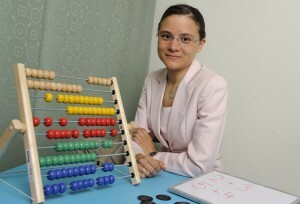 Libertus and her colleagues Lisa Feigenson and Justin Halberda, also of the Kreiger School’s Department Psychological and Brain Sciences, found that the precision of children’s estimations correlated with their math skill. That is, the children who could make the finest-grained estimations in the dot comparison task (for example, judging that eight yellow dots were more than seven blue dots) also knew the most about Arabic numerals and arithmetic. Still in question, of course, is the root cause of the link between number sense and math ability. Do children born with better number sense have an easier time learning to count and to understand the symbolic nature of numbers? Or it is just that children born with less accurate number sense may end up avoiding math-related activities before they develop competency? This study was funded by the National Institute of Child Health and Human Development.